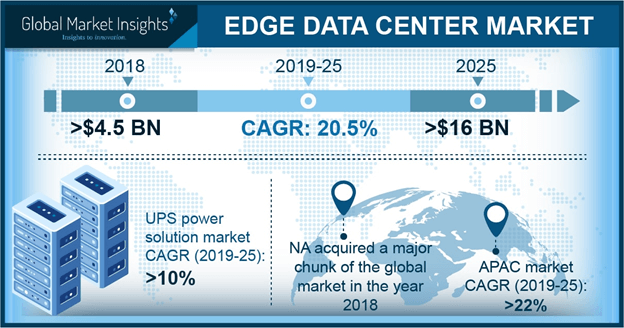 Edge Data Center Market size was valued at over USD 4 billion in 2017 and will grow at a CAGR of around 20% from 2018 to 2024. Edge data center market is expected to grow substantially over the coming years owing to a rapid growth in the demand for Over-The-Top (OTT) video and high-quality content, encouraging companies to implement network facilities at the edge locations. These facilities are self-contained data centers with integrated computing, storage, networking modules, and run applications in a secure computing environment. They are standard prefabricated modules and are ideally deployed for high-density networks. Centralized infrastructure facilities that caters to several geographical areas encounters several issues such as data congestion, weak connections, thereby stressing the need for edge facilities. Several telecom & service providers are witnessing increased requirements for these facilities due to the rise in the demand for high computational power. Moreover, several hosting service providers are increasingly offering tailored services for hosting data centers at edge locations for low-latency connectivity, providing several opportunities to the edge data center market. Rise in proliferation of IoT is compelling service providers to move their facilities closer to the network edge. Offering local connectivity to the network edge has resulted in improvement of the quality of security and services provided. Increasing data storage requirements in metro areas and remote locations are expected to accelerate the edge data center market growth. These infrastructure facilities are being deployed closer to the local areas they serve. They provide enhanced management for accessing and storing the data, thereby increasing its adoption by SMBs and other enterprises. These companies depend on small- to mid-sized versions of infrastructure facilities that can serve the purpose of information processing. Factors such as growth in CDN traffic and increasing adoption of the IoT technology in industries are boosting the edge data center market globally. DCIM solutions are witnessing a high adoption in the edge data center market owing to the increasing applications of these software technologies for asset management, data recovery, and incident management. IT managers are dependent on these solutions for the management of power and cooling solutions. These solutions help in reducing the time and efforts of operators to manage and monitor each electrical device and analyze & predict system failures or downtime. Several advantages offered by these solutions include access to accurate data, better predictability for power, space and cooling capacity, enabling centralized management and complete monitoring of resource utilization. Several software providers are offering these solutions to the companies for effective management and maintenance of IT assets, thereby providing an impetus to the DCIM edge data center market growth. For instance, in October 2017, Schneider Electric launched EcoStruxure IT, which is a cloud-based DCIM tool developed for hybrid IT environments. The installation & integration services are witnessing a high demand in the edge data center market due to a rise in the adoption of these infrastructure facilities in several business sectors. These businesses are dependent on manufacturers for effective maintenance, management, and installation of the IT facilities. The rise in additional costs associated with the establishment of separate IT department in the businesses is also a major factor driving the adoption of such services in the market. 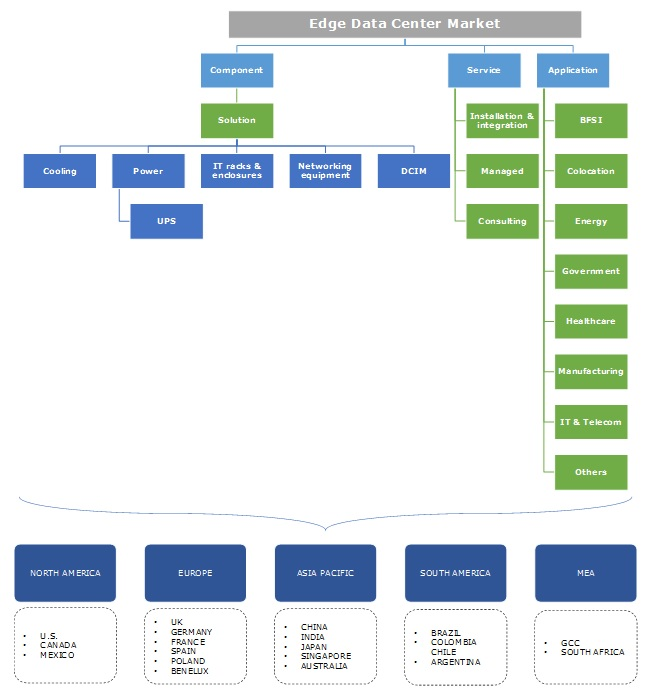 Several major companies operating in the edge data center market are offering such services to their clients. For instance, Fujitsu Ltd. is offering managed infrastructure services to its clients for the remote management of their IT assets. In 2017, the IT & telecom sector accounted for over 30% of the overall edge data center market share and is witnessing a high adoption owing to the rise in demand for advanced facilities for data traffic management and information access applications. Several business operations in the sector are witnessing a rapid expansion and growth and are experiencing an increase in expenses and costs for managing large data center facilities. These factors are driving the demand for enhanced facilities for better management and access to the data, driving the edge data center market. The BFSI sector is witnessing a high adoption of these facilities owing to the rising concerns for the security and safety of the information. Increasing amounts of confidential customer data need to be stored and processed in a secure environment. The companies are witnessing a high demand for IT facilities that are near their operational centers, which will allow them to perform several advancements and modifications in the devices in a very efficient manner. The advantages offered by these facilities to the companies include reduced risk of data theft or loss, faster disaster detection, prediction & prevention, enabling faster intelligence and reduction in data transmission times. Such factors are encouraging the banking institutes to modify their traditional facilities, providing an impetus to the edge data center market growth. The North America edge data center market is anticipated to grow at a CAGR of around 19% over the forecast timespan owing to the rapid increase in the adoption of advanced computing technologies. Countries including the U.S. and Canada are implementing these facilities for improving the effectiveness and productivity in business operations across several industrial sectors. Major technologies such as IoT connectivity and cloud computing are digitalizing the industrial processes and operations, providing a boost to the edge data center market. Increasing amount of data generated by robotic devices in these industries is forcing companies to rely on these facilities. Moreover, a strong presence of global players in the IT & telecom sector and rapid expansion of their customer base are driving the demand for effective data management solutions. Growing adoption of the advanced infrastructure facilities in European countries is expected to drive the edge data center market. Several regional companies are depending on these facilities owing to features such as increased energy efficiency and enhanced power management. The traditional facilities generate a large amount of heat and require enormous amounts of power to function at optimum levels. Edge facilities offer a greener alternative as these data centers are more energy-efficient and less harmful to the environment. These facilities are deployed as self-contained micro-mobile data centers and can operate at Power Usage Efficiency (PUE) levels that are around one and allow a further reduction in operational costs and power consumptions. Such factors are encouraging the companies operating in the region to transform their conventional systems to sustainable technologies, thereby propelling the edge data center market growth. Key players operating in the edge data center market are Rittal GmbH & Co. KG, Huawei Technologies Co., Ltd., Hewlett-Packard Enterprise Company, Eaton Corporation, IBM Corporation, Hitachi Vantara, Vertiv, Co., Panduit Corporation, Flexential Corporation, 365 Operating Company LLC, vXchnge Holdings, LLC, EdgeConneX, Inc., Vapor IO, Inc., Schneider Electric SA, and Fujitsu Ltd., among others. The players in edge data center market are offering their products and services to several industrial and government sectors where a high demand for these data storage facilities is being witnessed. In September 2017, EdgeConneX, Inc. announced the launch of its edge facility in Toronto, Canada to offer a strong connectivity to the customers residing in the metropolitan area. Companies participating in edge data center market are offering products for improving the efficiency and reliability in data management and security in several sectors. The presence of global players in the ecosystem is restricting the entry of the new entrants. These companies are establishing long-term partnerships and collaborations with the leading industrial players with an aim to strengthen its market presence. They are adopting several strategies for driving the demand of their offerings in edge data center market. These strategies include product differentiation, new product development and mergers & acquisitions. For instance, in April 2018, ABB Ltd., The Hewlett-Packard Enterprise Company and Rittal GmbH & Co. KG announced the launch of Secure Edge Data Center (SEDC) for telecommunications and industrial environment. The industry is experiencing a rapid growth owing to the rise in demand for the effective storage and processing devices located at the edge of a network. In the edge data center market, companies are making several efforts to reduce their overall operational costs by adopting the edge facilities. With the transformation of their traditional facilities to edge networking, the industries are saving their additional expenses, thereby experiencing a high revenue generation. In addition, the adoption of several advanced technologies in industrial sectors such as preventative maintenance and automation & robotics technologies is also a major factor propelling the edge data center market. The predictive maintenance solutions are being widely adopted by the manufacturing industry for gathering real-time information on the status of the industrial equipment. Maintenance technologies are adopted in other industrial sectors such as oil & gas and energy.